The guided missile cruiser Moskva of the Russian Black Sea fleet passes through Bosporus strait. 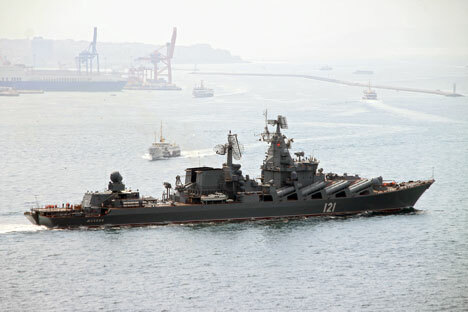 The missile cruiser Moskva, which was protecting the air base Hmeimim in Syria, has returned to Sevastopol from the Mediterranean, Captain I Rank Vyacheslav Trukhachyov, an official representative of the Black Sea fleet, told Interfax-AVN on Jan. 9. "The guard missile cruiser Moskva under the command of Captain I Rank Alexander Shvarts has returned to Sevastopol today after fulfilling missions in the Mediterranean," he said. The cruiser Moskva left Sevastopol on September 24, 2015. That mission to a far-range sea zone was the third mission for the Black Sea flagship in the course of a year. "The crew of the cruiser was part of the Russian naval permanent unit in the Mediterranean, it was providing air defense protection to the Russian air base Hmeimim on the territory of the Syrian Arab Republic," Trukhachyov said. The cruiser Moskva was replaced in the Mediterranean by the Pacific fleet guard missile cruiser Varyag.